GOODWATER, Ala. (AP) - A judge pulled a gun on a crutch-swinging defendant who went wild in a crowded rural courtroom after being found guilty of harassment Thursday, a witness said. A police officer shot and wounded the man, who had a cast on his leg, after he lunged at the judge and tried to grab the weapon, authorities said. But some witnesses disputed the account, saying the man who was shot never threatened the judge. Stuck by at least one bullet, the man was taken by helicopter to the hospital at the University of Alabama in Birmingham, where he was in good condition. "The guy came over the bench at him trying to get it," said attorney Keith Warren, who was in court representing another person. "He just literally got in the judge's face, then backed off and started swinging the crutch at the judge." Some of the 40 or so people who were in the courtroom disagreed, saying they did not see the man attack the judge, who was sitting behind a tall desk, or attempt to grab a gun. Sara Williams said she was sitting in the front row when the man, whom she knew, got agitated after the judge fined him $800. He waved one of his crutches in the air. "The police were hollering for him to get down" when an officer opened fire, she said. Williams said she yelled "Don't shoot him no more!" right before the officer fired again. Afterward, she and more than a dozen people stood across the street from City Hall chanting, "We want justice." Witnesses identified the man who was shot as Bryant Keith Ford of Goodwater. "This gentleman forced the police officer to shoot him. There was no reason for the guy to become as irate as he got. He went nuts," Warren said. Anyone who claimed the man didn't attack the judge either was unable to see or was telling an "outright lie," Warren said. Court records showed that Ford, 25, was due in court on a harassment charge filed by a neighbor who claimed he cursed at her in December after accusing her of talking to police about him. Teel heard the case without a jury and the trial lasted less than five minutes. Teel's brother, Frank Teel, a lawyer in nearby Rockford, said the shooting happened at Goodwater City Hall, where district court proceedings are held once a month for people who can't get to the county seat. "I've not talked to him, but I'm told he was OK," Frank Teel said of his brother. The judge's aide suffered powder burns, he said. Goodwater is a town of 1,500 about 60 miles north of Montgomery. 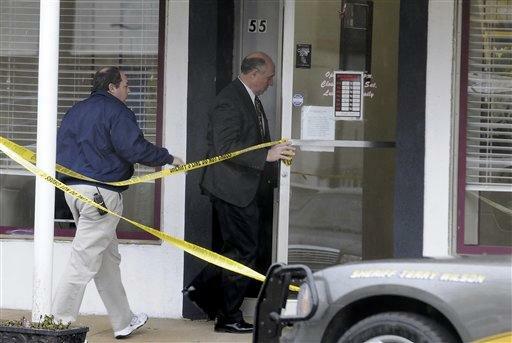 Associated Press Writer Jay Reeves in Birmingham contributed to this report.